Boys’ Town was established in 1944. 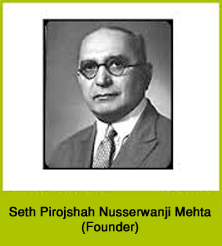 At the helm of the magnanimity of the venerable philanthropist, the late Seth Pirojshah Nusserwanji Mehta, whose love for children and noble desire to spend time, energy and money in the cause of education, prompted him to establish a residential school at Nashik that would serve the society. Though an industrialist of great stature and a mill magnate he was conscious of the educational needs of the children of his country, whose interest was uppermost in his heart and mind. To give them all-round education, with many amenities at low fees, and to inculcate in their impressionable minds the principles of Good Citizenship, he established ‘Boys’ Town’; a residential school at Nashik. It is being run by the P. N. Mehta Education Trust, Mumbai. Rendering 60 years of service towards the welfare of the children.